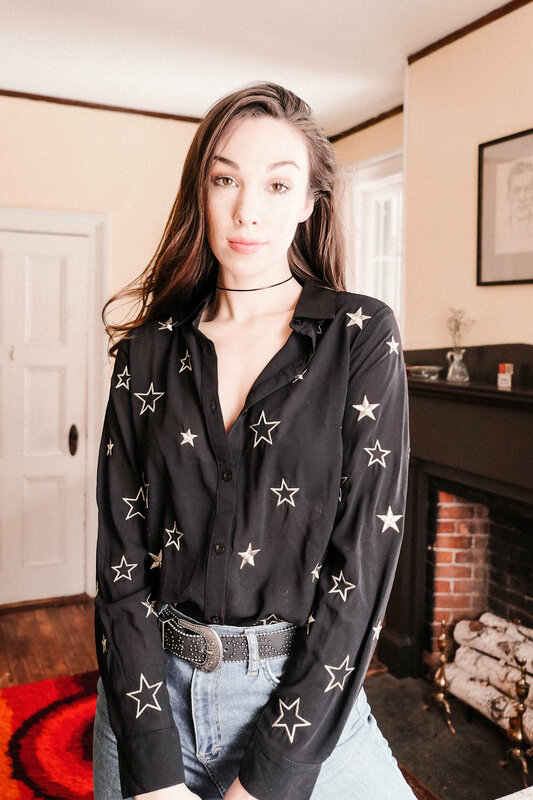 Inspired by the 70s, this look revolves around this Star Button Up top from Shop Sugar Sands. It's silky, soft, slightly sheer and sooo versatile. Wear it tucked in, tied in front, or layer it under a sweater. I was lucky enough to shoot at another Airbnb this past week, and this room was one of my favorites in the house. The crazy rug is from the 1970s and the owner, Clark was filled with stories from that era. The house is beautiful, creative, and a vintage lovers dream. If you're looking for a unique getaway, I definitely recommend booking a stay there! Outfit details below.